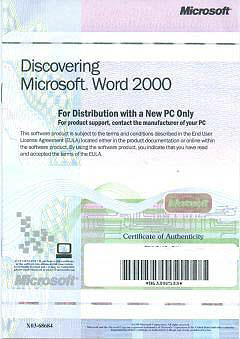 Microsoft Word 2000 was designed to be the easiest way to create common Web, e-mail, and print documents around the world. Microsoft Word is currently the application of choice for creating print documents. Is it HTML or a DOC file? The answer is: You probably won't care, thanks to Word's seamless treatment of the two file formats. Using XML coding contained within the HTML file, Microsoft embeds key data about your file--everything from the word count to the line and fill colors. It's quite amazing. In fact, when you employ Word in conjunction with Internet Explorer 5.0, you can view either a DOC or an HTML file within the browser and click on Edit to launch the document. You can then make your changes and simply click on Save--by default Word saves it in its original format, but the Save As option lets you easily convert between the two. Includes OEM Manual w/ Integrated COA Only in a Custom Plastic Package with Unique Product Key Number! !